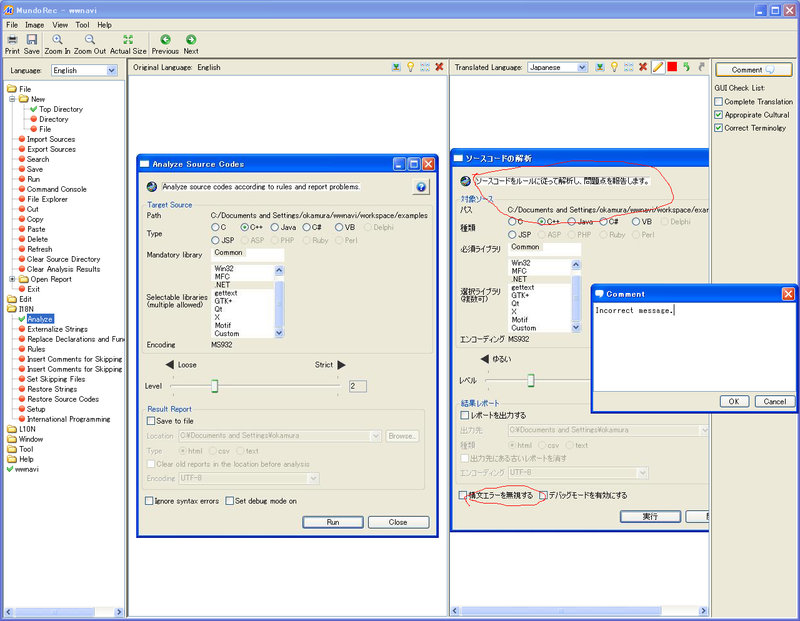 MundoRec detects the software menu structure automatically and capture the original & translated language screens dispatching the menu, and gives checking views with mark-painter, check-item list, and free comment insertion. The testing reports can be generated such as html, csv, txt, pdf with captured images, check result, and comments. After internationalization(I18N) by World Wide Navi and localization(L10N) by Sisulizer, check your software translated correctly with MundoRec! Mundorec is currenlty a RC version, please give us your feedbacks and opinion! Able to detect the Application's menu automatically. All captured images saved in a project.You can view all images in a Main Window. You can match the images of the original and translated. Can make a direct comparisons between two images in a single window. You can draw on image using a pencil tool to make any remarks. User Interfaces are available in English and many other languages. For requests and inquiries, please contact us on our inquiry address.